Rudy is a three-month-old Siberian Puppy that is ready to take on the world! He is a smart boy and is learning housebreaking 101 and crate training. 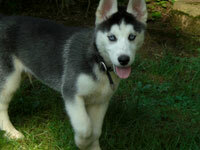 Of course, husky puppies are a handful and require constant supervision and a lot of training and guidance. Rudy will need to go to a home where he is not alone for more than four hours. Large dog/Siberian experience will be best along with another dog as a playmate and a good sturdy fenced-in yard/playground. If you are up for the husky puppy challenge, meet the above criteria and have the time and patience to commit to a puppy and a lifetime pet, please submit our online application. In addition to the $250.00 adoption fee, there will be a neuter deposit and adoption will not be finalized until we receive a neuter certificate from a licensed vet. Serious inquiries only please.